On January 30, 1972, a peaceful march of civil rights protestors proceeded down from Creggan through the Bogside section of Derry City in Northern Ireland. The march was protesting the denial of rights in housing, voting, and employment to the Catholic minority in the country. The marchers were also protesting the internment of Irish citizens without trial. A large British military presence and barricades prevented the march from going to Guildhall Square at the waterfront of the city. The marchers then moved to gather at Free Derry Corner in Bogside, the Catholic section of the city. 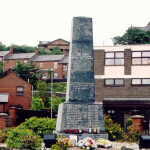 The Northern Ireland Civil Rights Association organized the march as a peaceful (in the spirit of Dr. Martin Luther King, Jr.) solution to the deadly violence that had overtaken Derry in recent years between British soldiers and members of the IRA. When most of the more than 15,000 marchers turned the corner toward Free Derry Corner, some of the younger marchers rushed the barricades that protected the route to the Guildhall. The soldiers fought them off with water cannons, tear gas, and rubber bullets. 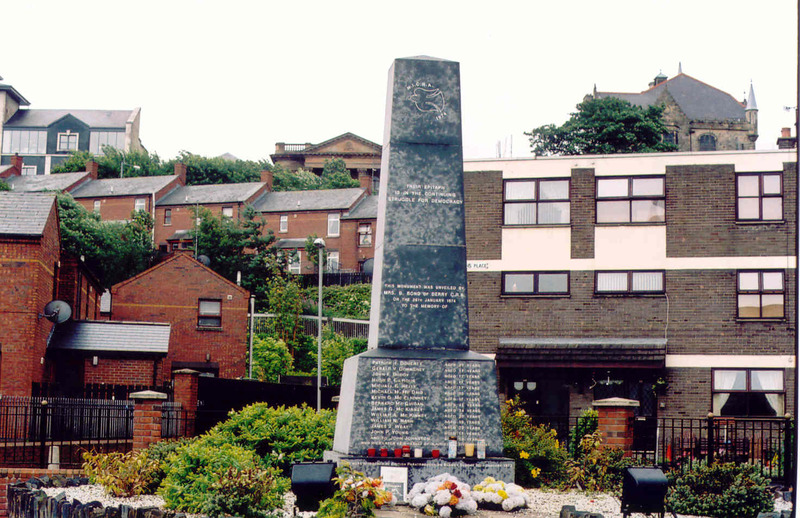 At one point, when someone suspected an IRA sniper was firing at soldiers, the British First Paratrooper Regiment was given orders to go into Bogside with live rounds of ammunition. The paratroopers pursued those running away from the barricades to the edge of Free Derry Corner where the main body of marchers were gathered. The British soldiers fired their weapons and many unarmed civilians were wounded. Of these, 14 died of their injuries. Over 100 rounds were fired. Many who were killed were either fleeing the army or assisting those who were wounded. 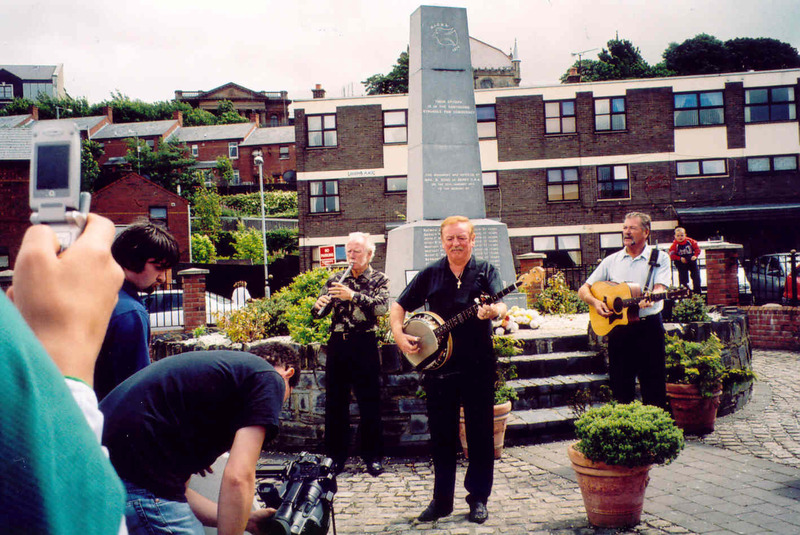 The Wolfe Tones recording “Sunday Bloody Sunday” video at the Bloody Sunday Memorial. The Gallagher sept is descended from Gallchobhar who lived around the 8th century. Gallchobhar (whose name means “foreign help”) was a member of the Cenel Connail and a descendant of many Irish chieftains including Niall of the Nine Hostages, a High King of Ireland who ruled in Tara at the end of the 4th century. Three of Niall’s sons founded kingdoms in Ulster and his other sons had kingdoms in the Irish midlands. Niall’s son Conall became the king of Tir Conaill (Donegal) in western Ulster. During Conall’s reign, Christianity became the dominant religion of the country through the efforts of St. Patrick. It is believed that St. Patrick baptized Conall. Conall was killed in 465 and his son Fergus Cennfada took over. Fergus had three sons, Brenainn, Feidhlim, and Sedna. Fergus’s son Feidhlim was the father of St. Columba (the missionary who brought Christianity to Scotland), and Sedna was the father of two sons, Lughaidh and Ainmire. Lughaidh, was an ancestor of the O’Donnells who were to rule Tir Connail during much of the 2nd millennium. Ainmire, a direct ancestor of Gallchobhar, became one of the High Kings of Ireland (564-566 AD). Like most of the Irish High Kings at the time, he was killed in battle (by a warrior named Fergus, son of Nellin). Ainmire’s son Aodh (Hugh) became High King from 568 to 594 AD. One of his first acts was to kill Fergus in revenge of his father’s death. Aodh met his death in battle when he went to collect taxes from the Province of Leinster. Aodh was the father of Mael Cobo who ruled Ireland from 608 to 610 AD. From Mael, the genealogical line to Gallchobhar is as follows: Cellach (who became a High King with his brother Conall from 640 to 656 AD), Donal, Donncha, Rurai (Rory), and finally Gallchobhar. It is believed that the use of surnames came about when Brian Boru was High King of Ireland. He desired his subjects to adopt a surname to keep order among his many subjects with similar names. Gallchobhar’s descendants chose Ui Gallchobhar (O’Gallagher) as their surname. Obviously the warrior Gallchobhar had made a favorable impression on the Irish during his lifetime. The members of the O’Gallagher clan were valuable subjects of the Cenel Connail chieftains. From the beginning, they produced military officers and clerics. The first mention of the O’Gallaghers in the Annals of the Four Masters was when it was recorded that Mael Cobo Ui Gallchobhar, abbot of Scrin Adamnain, died in 1022. In the 14th century, when the O’Donnells ruled Tir Connail, the Gallagher clan was in charge of the cavalry in O’Donnell military campaigns. 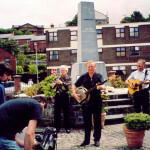 The O’Gallaghers were based in Raphoe and Tirhugh. They kept high ranking positions in the O’Donnell military forces until the end of the Nine Years War with England that ended the O’Donnell reign. The Gallaghers produced many clerics. Bishops of Raphoe had to meet the approval of the ruling O’Donnells, and they were usually selected from the members of Cenel Connail. The Gallaghers were members of this clan and closely related to the O’Donnells. Six Gallaghers were bishops of the Raphoe Diocese in the 15th and 16th century. The land of Tir Connail was wild and remote from Rome in those days. Many clerics didn’t follow the customary vow of celibacy and the Gallaghers were no exception. The monk Gilla Coimded O’Gallchobhair of the 14th century had at least two children. One of his great-grandchildren was Lochlann O’Gallchobhair (Laurence O’Gallagher) who was the Bishop of Raphoe Diocese in Tir Connail from 1418 to 1438. Like his great-grandfather, Bishop Lochlann O’Gallchobhair had several descendants. One was Reamonn, the vicar of Drumhome in south Tir Connail. Lochlann had a son or grandson, another Laurence O’Gallagher, who was Bishop of Raphoe between 1466 to 1477. This Gallagher got in trouble for keeping mistresses at some of the parishes he frequently visited. This almost earned him an excommunication in 1469 from John Bole, the Archbishop of Armagh. It is believed that he was reinstated by directly petitioning the Pope (and by bribing enough people in Rome). He was absolved as long as he didn’t bring any more scandal on the diocese. Apparently he behaved himself for the remainder of his lifetime. During this period, the Gallaghers were still active in military campaigns. Many of their leaders were killed in battles with rival chieftains. In the 16th century, the Gallaghers started opposing the O’Donnells briefly for religious reasons after King Henry VIII of England declared himself King of Ireland and head of the church. It started when Cornelius O’Kane, Bishop of Raphoe, accepted Henry over the Pope. The Pope then appointed Edmond O’Gallagher to replace him. In order to maintain his lands and power, Manus O’Donnell, Lord of Tir Connail, had to recognize Henry VIII as King of Ireland and leader of the Irish Church. Manus had to defend the faith from anyone who would advocate papal authority. As a result, Manus supported Bishop O’Kane over Edmond O’Gallagher. O’Gallagher was never accepted as bishop, and he died mysteriously in 1543. The O’Gallagher clan then seized Manus O’Donnell’s Lifford Castle in retaliation. This victory was short lived. Manus’s son Calvach recaptured the castle in 1544. The Pope later appointed another Gallagher as Bishop of Raphoe. This was Art O’Gallagher (believed to be the grandson of Bishop Laurence O’Gallagher). Bishop O’Gallagher didn’t assume his duties until 1553, when the English Queen Mary restored Roman Catholicism as the state religion. Bishop Art O’Gallagher served until he died in 1561. Although, Elizabeth had become Queen of England at this time, the next Bishop of Raphoe was appointed by the Pope. It appeared that, with the death of Manus O’Donnell in 1563, the practice of Catholicism continued in Tir Connail up to the end of the Nine Years War and the plantation of Scotch and English Protestants in Ulster. The Gallaghers had a saintly prelate in Reverend Redmond O’Gallagher. Redmond O’Gallagher was Bishop of the Derry Diocese at the time of the defeat of the Spanish Armada and helped survivors escape capture by the English. He also was bishop during the ill fated Nine Years War and was captured by the English and martyred in 1601. After the Nine Years War between the Ulster Earls and England, five of the O’Gallagher lords escaped to the Spanish Netherlands with Hugh O’Neill and other O’Donnell earls. (This was known as the “Flight of the Earls”). The Gallaghers who remained in Ireland fared poorly in the subsequent English “plantation” of Ulster, losing much of their land. The Gallaghers produced many descendants. 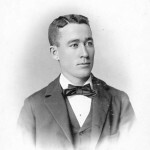 Gallagher is the most common surname in Donegal today and is one of the top 20 most common names in Ireland. I believe that my great-grandfather was James Gallagher who came to Philadelphia from Derry on a ship in 1848 during the Great Famine. James lived in Castlefin, County Donegal with his siblings and his parents, James and Catherine. 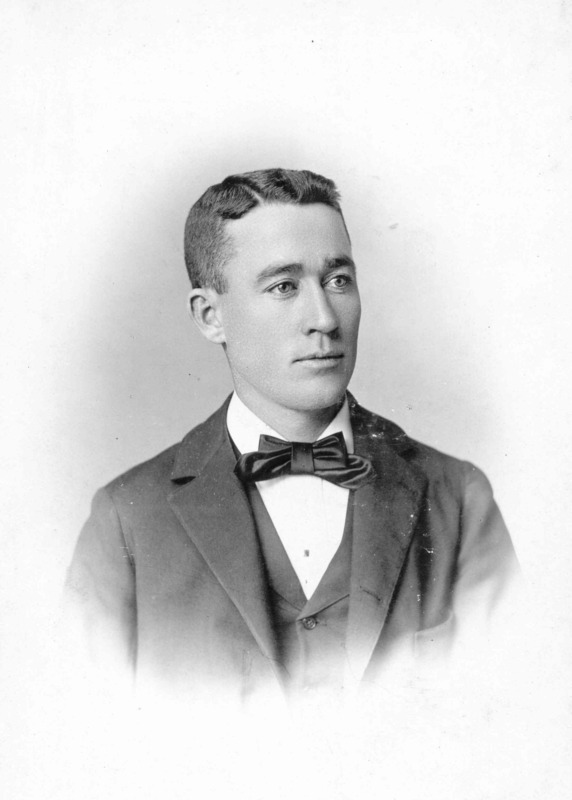 When he was 6 years old, his family emigrated to America on the ship, Hannah Kerr, and settled in Kellyville (Upper Darby), Pennsylvania.